Well, that was some weekend. Thank you to everyone who made it memorable and enjoyable from beginning to end. I am now officially in the 40+ gang but the compensation is that I have a new baby...more about that below.. The weekend kicked off with a girls' lunch on Friday. I went for a classic blazer from ASOS and skinny jeans from GOK at Sainsburys and teamed them with a pink lace peplum top from Dunnes and cobalt blue heels from Florence & Fred. 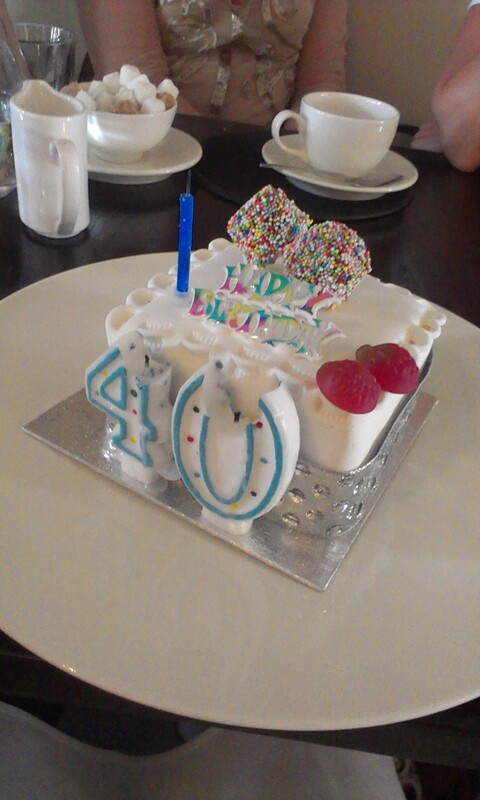 Had such a lovely time at this lunch and got to blow out the candles on cake number 1! Saturday saw a trip to Belfast where I had 40 minutes to buy something for £40. Can you tell there is a theme here? Well, I decided it would be appropriate to find something in the 40% off sale in House of Fraser where I picked up this Mary Portas top. I then used some birthday money to pay for a Pluck & Devour Ampersand Pendant. I've wanted one of these for ages so I was delighted it was in stock. 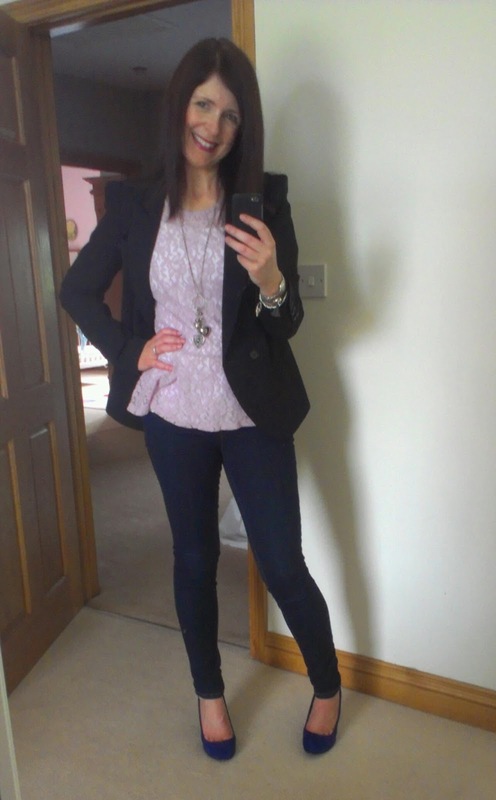 Then it was a night out with hubby later on Saturday to Sole Seafood on the Lisburn Road (my new LK Bennett heels had a debut - post to follow!) 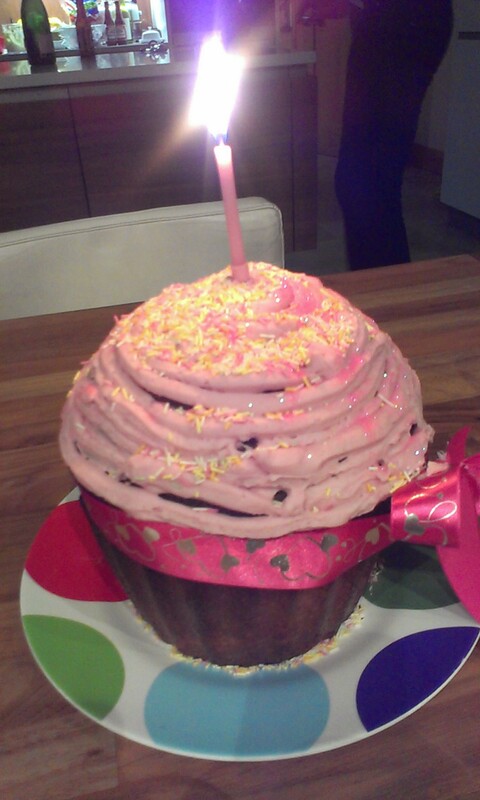 and onwards to our neighbours for more drinks and birthday cake number 2! Sunday morning the whole family headed on a day trip 40 miles from home - Carlingford, Co Louth, where we wandered around the antique shops and even found a few great clothing/shoe shops. Wearing my new Mary Portas top & Pluck & Devour pendant along with a denim jacket, white jeans, tan brogues from Hobbs (NW3 - from eBay!) and my vintage navy quilted bag from this post last year. And it was a family BBQ on Sunday night with cake number 3 and I (FINALLY!) got my new baby! She's called Prada and travelled all the way home from France with us but hubby then hid her until last night. This bag is a joint present from my lovely hubby, all of my family, all my in-laws and my godparents. Thank you all - it's something I shall treasure forever. More photos on another post. I think she deserves one of her own! I am really going to copy your party style in September when I become 40 years young! 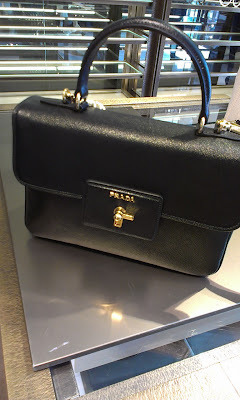 Loved reading your birthday post...now I just need to get a Prada handbag so we can be twins! Happy Birthday. It sounds like it was a perfect 40th. A rail your bag is beautiful....what a fantastic present !! We'll have to celebrate your 40th when we catch up later in the month! I swear you're looking younger and younger by the day. Happy belated BD! You look beautiful and I can NOT believe you are 40 whoa! Must share your secret! Now that's a baby I wouldn't mind having! Lovely pick Avril and it looks like you had a lovely time with cake galore! Happy Birthday! I am new to this blog but I've been reading it for the past year (sent you an email recently re the navy and orange scarf, placing my order this week!) Love how you celebrated turning 40. I've been there already but think it's a fabulous way to celebrate any birthday! Your bag is stunning. So much fun and so many treats! I saw this Mary Portas top in her magazine - can't believe the bargain you got! And of course I love the Ampersand necklace, I have had so much wear out of my bracelet! The Same Outfit - One Year On!